Ideon helped Home Matters tap into the universal, emotive appeal of Home. 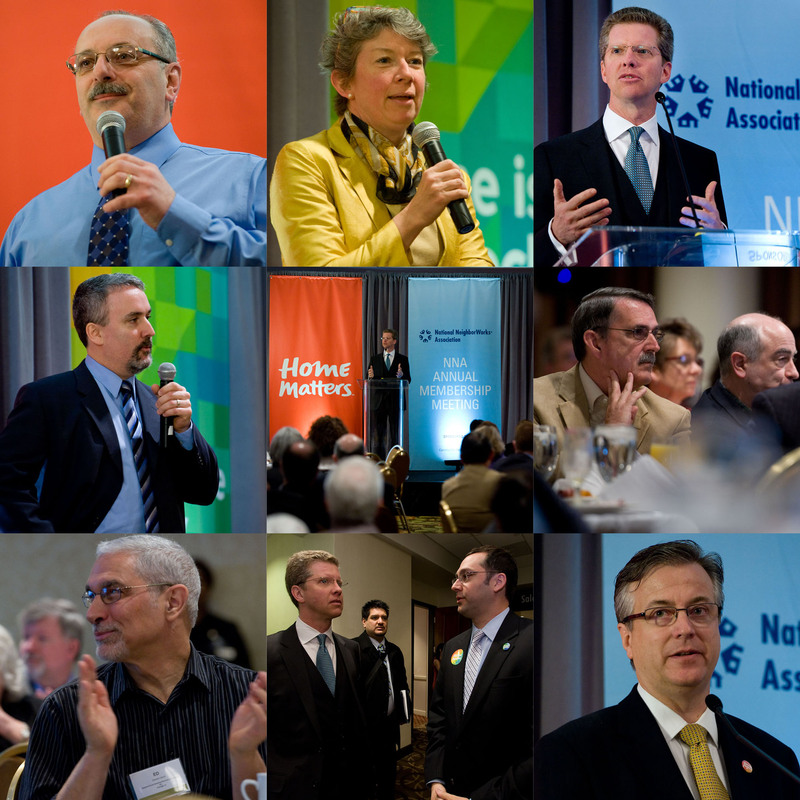 The Organization—The National NeighborWorks® Association (NNWA) unites housing and community development practitioners to advocate for housing and economic opportunities for individuals, families, communities and neighborhoods across the US. The Challenge—To return “Home” to the national agenda via a new movement called Home Matters, after it had been had been subsumed and devalued by the mortgage crisis. The Insight—The power of branding to override economic challenges. Shift focus away from the housing industry and Washington DC’s beltway to Americans, engage them in the conversation about why everyone needs a safe home and 21st century neighborhood. Conversation: Create a uniquely powerful, emotive and relevant movement built around the value of Home in a recessionary market. Clarity: Elevate Home Matters from a loosely defined concept to a bold, tangible, public-facing brand and movement around the meaning of home. Currency: Call attention to the essential role Home plays in American life, and shed light on the connections between stable housing and other areas vital to society like jobs, education, health, the economy and public safety. Culture: Deliver multiple branding workshops to train boots on the ground to deliver the on the brand. 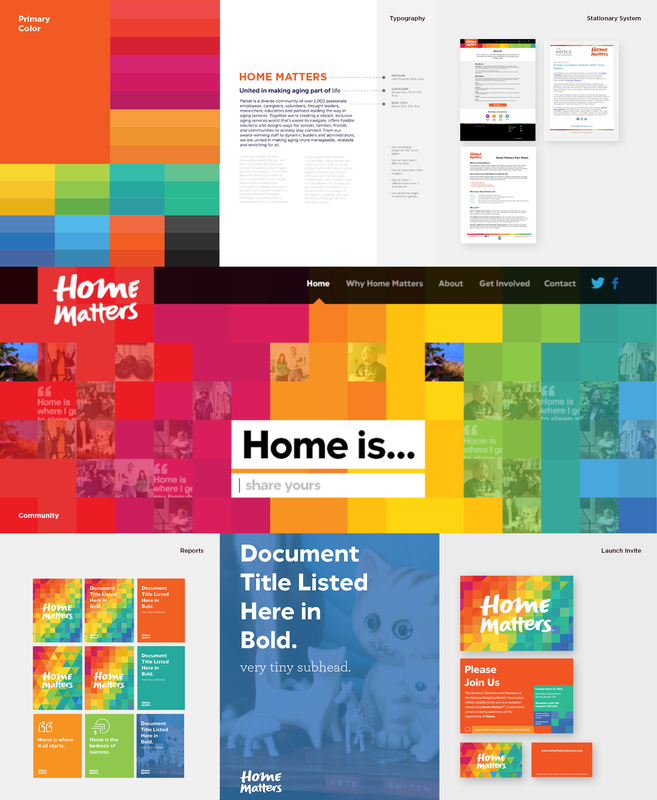 The Result—Home Matters reoriented the housing industry and consumers to think of and NNWA boots on the ground to deliver home as a foundational bridge to an enriched life, imbued with access to education, healthcare, transport, services and more. We designed a logo that is at once energizing and comfortable—just like home! Detailed guidelines help ensure that Home Matters' communications are clear and consistent. 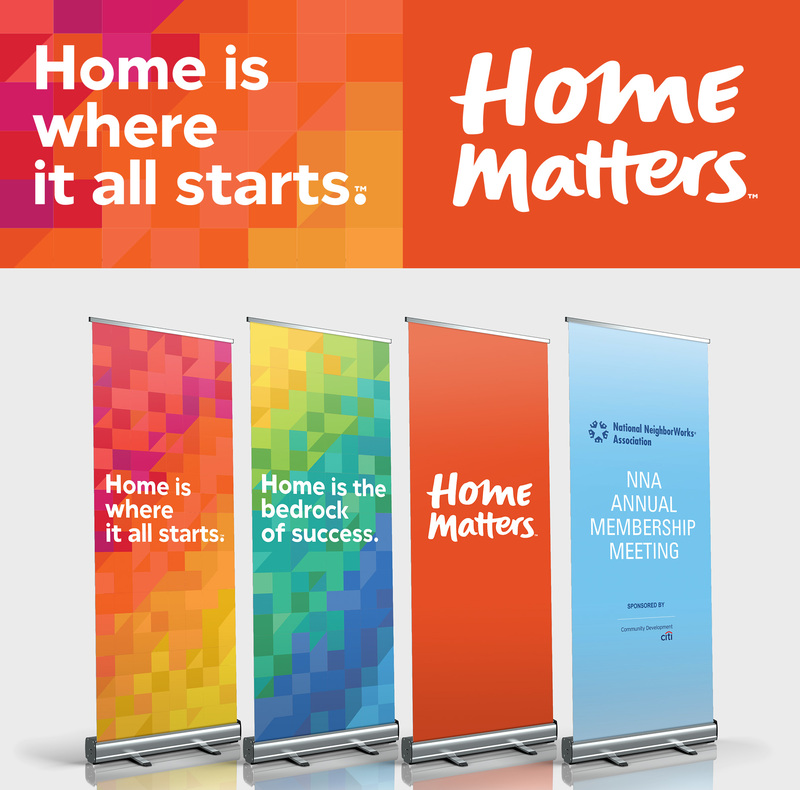 Stand-alone banners inject Home Matters' vibrate colors and compelling ideas into the physical environment. 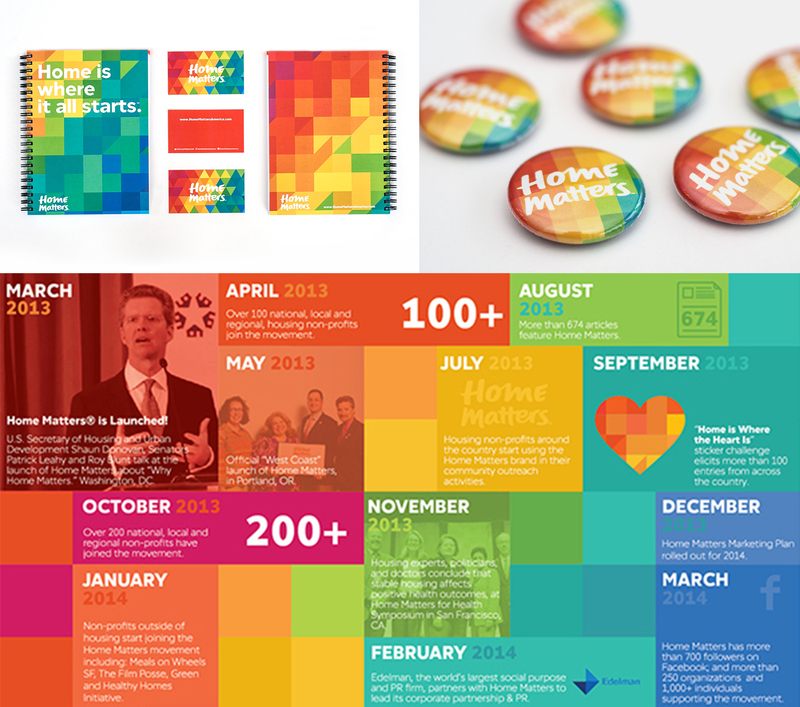 Notebooks, buttons, and calendars are a celebration of what Home Matters has accomplished, and what's next on the horizon. 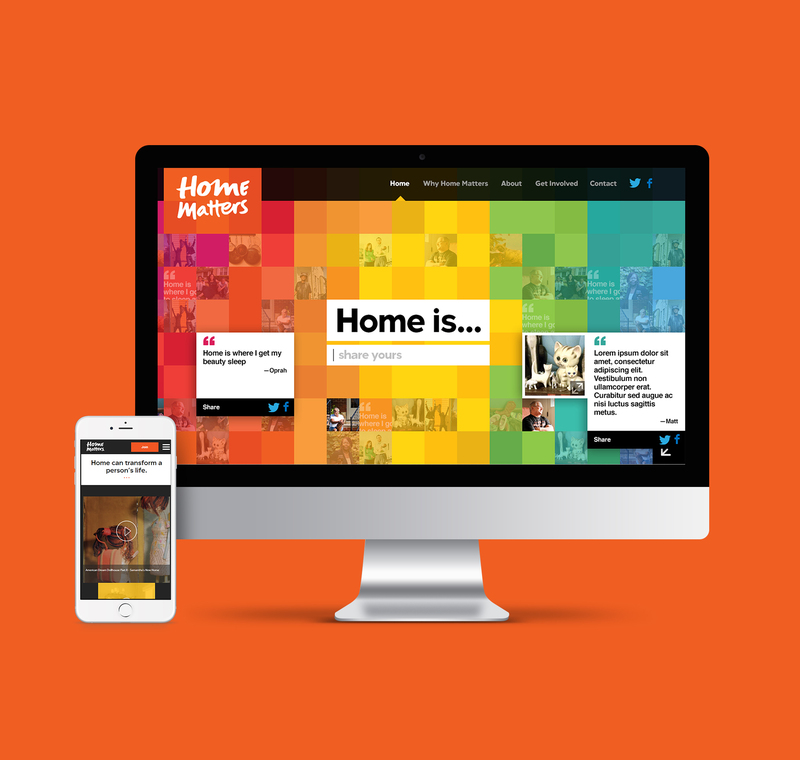 We designed an interactive website, inviting visitors to share what "home" means to them.